This week Glaxo Smith Kline began moving its Center City workforce to the Philadelphia Navy Yard. With 130 employers and 10,000+ employees in the Navy Yard, the bicycle commuting traffic heading south will only grow. Yet South Philly has not seen the infrastructure investment other neighborhoods have received to accommodate rising bicycle commuting rates. Fortunately invested groups and the City of Philadelphia are working on making bicycle commuting to the Navy Yard easier. We worked with the Community Design Collaborative to develop conceptual plans to make 13th and 15th streets bike-friendly north of Oregon Ave. South of Oregon the Delaware Valley Regional Planning Commission is completing conceptual plans for a shared-use path along South Broad St to the Navy Yard gate. 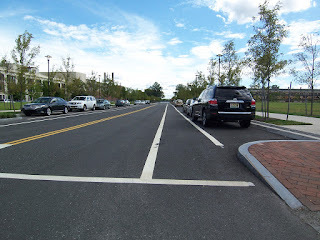 The City itself has a plan for the Navy Yard which features "bicycle routes" on multiple streets, and its Bicycle and Pedestrian Plan calls for bike lanes on Kitty Hawk Dr. and League Island Blvd. 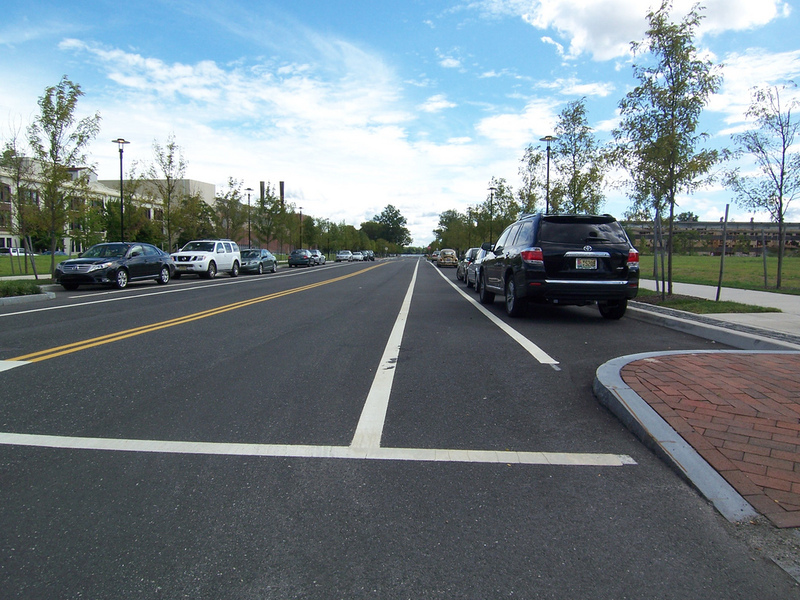 While this planning is all nice and well, Philadelphians need to bike to the Navy Yard today. Fortunately there already exist some very bikeable routes. We tweaked some suggested bike routes in Google Maps to give you some ideas.There are lots of options through South Philadelphia, but ultimately you will eventually have to get on to South Broad St to complete your trip. Google Maps pegs travel time from Central Philadelphia to the Navy Yard at roughly 30 minutes. And if the weather turns sour the Navy Yard Shuttle buses have bike racks. UPDATE: An original version of this reported 310 companies at the Navy Yard. The correct number is 130. The Navy Yard is really starting to look good! I am glad bike lanes were included in the revitalization plans. Can't wait to put some miles on them! I bike to work in the yard everyday through the back way (8th St. W). There far less traffic this way (safer, fewer honkers), and it is a bit more scenic. Your article states that you have to get onto S. Broad St. but this is a way around that. A lot of cars do not pass at a safe distance, and have almost gotten hit a few times from people running stop signs or from passing too closely at a high speed. I would love to see some bike lanes in the yard (and more bikers too)!